Northwest Electrical Services LLC was contracted by ButtCon Energy, of Toronto Canada, to develop and implement a control solution to replace and extend the functionality of existing CoGen controls at the GO Transit Streetsville and Oshawa sites located in Ontario Canada. Ability to access the system via HTML Browsers and IOS or Android based Devices. Real Time Data Acquisition Engine using Wonderware DAS Servers for PLC and Modbus Communications, and OPC servers for SNMP. Plant Historian for data logging of analog and discrete values. Object oriented graphical symbols used for visualization. Deployment of HMI graphics to nodes. 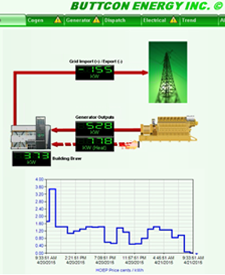 The benefit of using this software is that data can be gathered from a variety sources throughout the plant by the HMI. An OPC Server for Modbus is used to communicate between the existing Co-Gen unit controller and the HMI. An I/O server creates a communication link between the HMI and the new Allen Bradley MicroLogix 1400 controller installed. The result is a central location for users to visualize and control the entire plant. Each user is given a login for the HMI. Permissions are decided based on the login credentials. In order for changes to be made to the operation of the Co-Gen unit or plant, a user must be logged in and have control permissions. If a user does not have the necessary authorization, then the user is restricted to supervision only on the HMI. As a result, only qualified users to are allowed to control the plant and unintended operation of the Co-Gen unit are kept to a minimum. Local HMI functionality and accessibility are extended using the Wonderware InTouch Access Anywhere software. Users can remotely control and view plant information from anywhere on any computer or mobile device via an Internet connection. Users login with the same local HMI credentials to a secure dedicated website hosted and maintained by Northwest Electrical Services LLC. On the website, users view the same HMI graphics and have the same privileges of supervision only or supervision and control from a remote location as they would locally at the plant HMI. 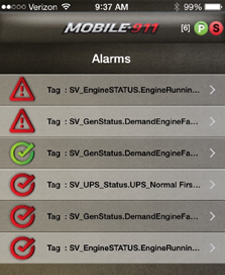 Even if a user is not monitoring plant status locally or remotely, the WIN-911 software connects to the HMI and monitors all alarm and event notifications. An email will be sent out to a distribution list if an alarm or plant change event occurs. All data available on the HMI is stored in the Wonderware Historian database. This allows users to access current and past operational data values when necessary. A user can trend past events for analysis, performance review or reporting. This past event retrieval can be done locally or remotely at the HMI. All software and applications are hosted and maintained by Northwest Electrical Services LLC, using redundant power, data storage, servers and is accessed by the client representatives via secure VPN login, and all data and communications to the site are accomplished through a site to site IPSEC tunnel. Northwest Electrical Services also provides continuous service and upgrades as well as modifications to the systems based on client request through a multiyear service and development agreement. In manual mode, a user can start and stop the Co-Gen unit as necessary. The unit will operate within acceptable parameters controlled by the Co-Gen unit’s controller. In commercial mode, the Co-Gen unit will start and stop based on a schedule or the market price of electricity. The schedule is set through the HMI by the user. The Co-Gen unit will start and stop at the scheduled time. It will run at the electrical output set by the user. If the price of electricity rises above a predetermined price then the Co-Gen unit will start and continue to run until the electricity price drops below the set price. Severe weather mode will override any scheduled dispatch of the Co-Gen unit. In this mode, the Co-Gen unit will start and follow the electrical load at the GO Transit - Streetsville plant. The MicrLogix 1400 PLC provides the logic to follow the plant’s electrical output for the Co-Gen unit to match. Load following allows the Co-Gen unit to power GO Transit - Streetsville in case the utility’s connection is lost during inclement weather keeping power disruptions to a minimum. Adding the SLC-500 PLC extends the functionality of the Co-Gen unit controller to meet the electrical requirements of the GO Transit - Streetsville plant by allowing the Co-Gen unit to respond to plant conditions. The solution designed and maintained by Northwest Electrical Services LLC used open industry leading products to create a system that allows for around the clock supervision and control without the need to have personnel located at the plant around the clock.